Alright, it is February, a month for tulip bouquets or roses, slated caramels and mini pink cupcakes (at least that's what my holiday was like) and we, for some reason come up with the most romantic coffee description of the year. Marketing? If only we were so savvy. We can't help it we love the Guatemala Zumay. Notes of chocolate nibs, Syrah and apricots intermingle in this rich and savory, heavy-bodied and mildly-acidic coffee. What makes the Zumay such an interesting coffee? Responding to a desire for consistent cup character and uniform standards, nearly all coffee produced in Guatemala is washed. And most of the time, this makes perfect sense: a great, high quality washed Guatemalan coffee (like the Finca Vista Hermosa) is a real crowd-pleaser. The Zumay is a different beast all together. It is honey processed (sounds sweet, right? and it is). A honey processed coffee is dried in the parchment layer with some of the cherry mucilage still attached (compare: in naturals all the fruit is left on and in washed coffees it is all removed). 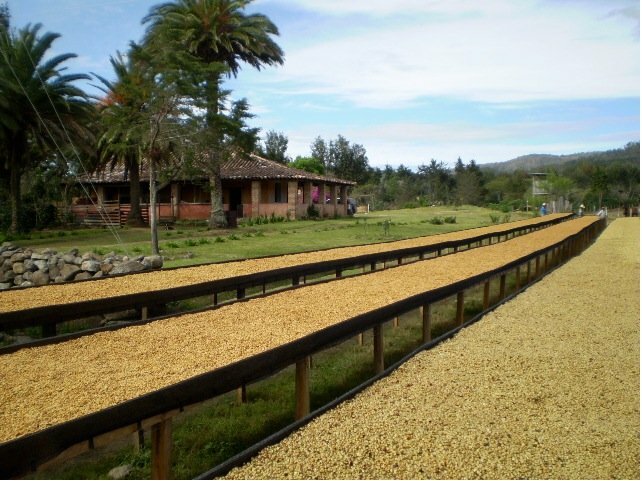 This process balances the benefits of washed and natural coffees. In the Zumay, a level of complex sweetness and heavy body are paired with a clean, consistent profile. All that and ethically sourced to boot. The Zumay was produced by the trendsetting Ninety-plus. Ninety Plus develops unique cutting edge coffees by managing all phases of the supply chain- from planting to farm management to distribution. The Zumay was grown without pesticides in the Jalapa region of Guatemala and processed in such a way to make the most of the natural elements while limiting the consumption of water.